The European starling, as the name implies, is not native to North America. It was introduced to the United States in the late 1800's and has spread across the continent. The starling, a Cavity Nester, is an aggressive species that competes with our native cavity nesting birds. Cavity nesting birds will use Nest Boxes (birdhouses) for homes. The starling is found across Kansas and the rest of North America. They tend to be found near human habitation. But unlike the house sparrow, they are also found in rural areas away from humans. The starling has caused the decline of many of our native cavity nesters by out-competing them for nesting sites. Starling compete directly with our larger cavity nesting birds such as the purple martin, red-headed woodpecker, northern flicker, and great-crested flycatcher. Woodpeckers are especially targeted by starlings. They even will drive out wood ducks, screech owls and kestrels from their nests. Because it is not native to North America it is not a protected species. Starlings can be legally trapped and killed. Eliminating them from the local population is the best and often the only way to allow our native cavity nesters to successfully raise broods of young in our neighborhoods. Being a year round resident, the starling starts adopting nesting places as early as December - well before our secondary cavity nesting birds start searching out nesting locations. For example the great-crested flycatcher does not return to nest until May. By then the starlings have commandeered available housing. Starlings will protect their nesting home against all other birds. Because they are so aggressive, other birds can't compete against them. And their populations are so great that when a native bird can defend the nest site against one pair of starlings there is a constant onslaught of more starlings looking for nesting places. For primary cavity nesters such as woodpeckers, the starling will wait for the woodpecker to excavate a home and steal it from them. Our larger woodpeckers, such as the northern flicker, red-headed, red-bellied, and hairy woodpecker, are most at risk. The starlings long piercing beak is used as a lethal weapon against woodpeckers and other cavity nesters. Our native birds are no match for the starling, but you can help them by controlling starling numbers in your neighborhood. Using bird houses that starlings can't enter will help our smaller cavity nesters. Starlings can enter a hole size of 1 ¾ inches in diameter or greater, but a 1 ½ inches in diameter hole will restrict their entrance. If allowed to breed, they will return to the same site each year. 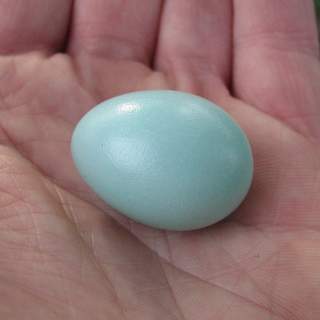 They will nest in a wide variety of crevices, such as holes in buildings, purple martin houses, and woodpecker holes. They should not be allowed to breed as they will produce offspring that will also compete with our native cavity nesters. If you aren't preventing starlings from nesting in your nest boxes, take down the boxes or plug the holes. For smaller birds like bluebirds, tree swallows, chickadees, and titmice; starlings can be excluded by making the hole size 1 ½ inches in diameter. This is the most effective method of preventing starlings from nesting in nest boxes intended for smaller birds. Starlings can enter nest boxes with a 2" diameter hole or larger. That is the size hole recommended for great crested flycatchers, red-bellied and red-headed woodpeckers. Flickers need a hole 2 ½" in diameter. Screech owls and kestrels require at least a 3" diameter hole. Therefore starlings will compete with all of these species for nest boxes. For nest boxes that permit starling entry, trapping starlings is the only real solution to prevent them from nesting. Using a nest box trap will allow you catch any starlings that try to take residence in a nest box. Many years ago, I left a dead hackberry trunk standing in my backyard specifically for woodpeckers. Leaving the dead tree worked. I had a pair of northern flickers excavate a hole in the tree. Excitement ensued as the flickers continued to excavate. But once their home was complete, a pair of starlings came and began pestering them. Finally the flickers gave up and the starlings nested in the hole. I was angry but didn't know of a remedy to the problem. I assumed there was nothing I could do to help the woodpeckers, until I discovered the nest box trap. Finally I found a solution to the starling nesting problem. The Purple Martin Forum has accounts of Starling Attacks on Woodpeckers and explains what a menace they are to our woodpeckers. Starlings are so aggressive that they will fight each other over a nesting until one of the attackers is killed. One time I found two starlings in a nest box that had fought to the point of passing out. I thought they were dead until they came to life when I reached in to examine them. Another time I found a bloodied dead starling in a box, the inside of the box was spattered with blood. This is a "must read" publication about Why Starlings Kill Each Other. In it, the author shows the death grip between two male starlings where both starlings died. There is no next box design that will prevent starlings from nesting other than reducing the hole size to 1 ½ inches. But that size also excludes larger cavity nesters. If you are placing next boxes with openings that allow starlings where there is human habitation, you will more than likely have starlings attempt to use them. Repeatedly removing starling nests from a nest box may get them to leave that nest box, but they will just go to another nest box. This can be even more disastrous if they go to a house that already has a native cavity nester. They will destroy the nest and may kill the adults. There is no way to deter starlings from using a nest box other than trapping them. There is one solution to the starling problem that works. It is trapping starlings using nest box traps and baited traps. The flickers can now nest in peace without the constant threat of starlings. This table reflects the number of starlings caught per year using both baited traps and nest box traps. 2012 1 0 1 Caught my first starling using a nest box trap in December. 2013 39 0 39 Only used nest box traps and only had 4 nest boxes that starlings could enter. 2014 36 188 224 Began using various styles of baited traps along with the 6 nest box traps. One solution to the starlings nesting problem is trapping them in nest boxes. Starlings are attracted to holes and cannot resist entering them. 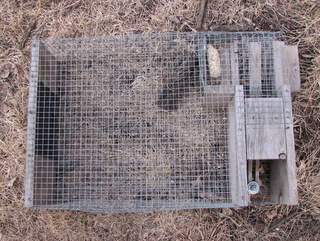 If starlings begin using a next box, a trap can be inserted to catch the intruders. The nest box trap captures the birds by covering the entrance hole.when they enter the nest box. They are not harmed by the trap. Once they are trapped, they can be removed and humanely killed, never able to harm our native birds again. 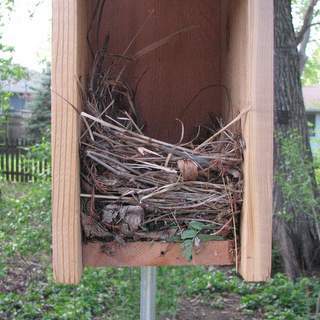 I find that the best nest box for trapping starlings is a nest box designed for Great Crested Flycatchers. It is about 5 1/2 inches square, 12 inches deep and has a 2 inch diameter hole. This sized box appeals to starlings. It allows them to enter but prevents Northern Flickers from entering. Starlings begin seeking out nesting sites in the winter. By February and March, their nest searching activities increase. During winter, I keep a trap in a couple of my nest boxes and monitor them throughout the day. Starlings usually enter the nest boxes early in the morning, usually around 8am. This seems to be the best time to catch them. But I have had them enter boxes in the evening after 5pm. Learn more about using a Nest Box Trap to capture starlings. Euthanizing Sparrows & Starlings explains methods for humanely killing these invasive bird species. The House Sparrow, another non-native bird, can be captured with nest box traps as well.. Learn to catch starlings in nest boxes using a VanErt starling nest box trap when starlings are seeking out nesting sites by watching this video. My starling trapping began in December 2012 when I noticed a house sparrow adopting one of my flycatcher birdhouses. I set the nest box trap and caught a starling instead of the intended sparrow. Once I saw that I could easily catch starlings, I drilled out another bird house to have a 2 inch hole and constructed a flicker birdhouse with the hole diameter of 2 ½ inches. I've added additional houses with holes ranging from 2 to 3 inches in diameter. All can be entered by starlings. The starlings tend to be caught a short time after sunrise. I've caught starlings in December and January, but mid February marks the beginning of the period when starlings begin searching for nesting sites regularly. Using nest box traps from February through May will give the greatest success. Their nesting period appears to end in May as I've never caught a starling in a nest box in June. In 2013. I noticed starlings were no longer visiting my yard beginning in June. In 2014 I caught my last starling on May 13. At the time I only had one flycatcher size nest box and it was occupied by great crested flycatchers. The starlings destroyed the flickers nesting in my yard in 2014. I think if I had more flycatcher sized nest boxes mounted in sunny areas they would have tried to nest in them. In 2015 I caught my last starling on May 28. I believe this was due to the fact that I had three flycatcher sized nest boxes in my yard. Starlings seem to prefer these to the flicker sized nest boxes. The Northern Flickers were able to nest because the starlings preferred the flycatcher nest boxes. When they would start nesting in a flycatcher sized box, I was able to trap them. This table reflects the number of starlings caught & eliminated by month using nest box traps in my yard. Occasionally I've had bird escape as I'm removing them from the box. They are not included here. I generally don't set any traps from June through November. As you can see February through May are the most productive months for trapping. As you can see there was a big spike in the number of starlings I trapped in May 2015. I believe this is due to the fact that I added 2 more nest boxes in my yard that are designed for Great Crested Flycatchers. These boxes have about a 5 1/2" square floor, are about 12" deep, and the hole is 2" in diameter. All three flycatcher nest boxes are mounted in open sunny areas on 10' tall telescoping poles. These seemed to be preferred by starlings. Of the total starlings trapped in nest boxes, 33 of them were caught in flycatcher sized nest boxes. Only 2 were trapped in flicker sized nest boxes and 8 in red-bellied woodpecker sized nest boxes. Nest box traps work well during the breeding season but using other traps during winter will help to control starlings. The traps all use bait to attract the starlings. 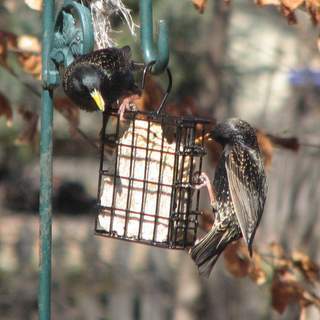 They only work if starlings are visiting your area to eat things like bread, suet, or grains. Late winter is a good time to trap starlings as they are seeking food such as suet at feeding stations. Suet appears to be one of their favorite foods. 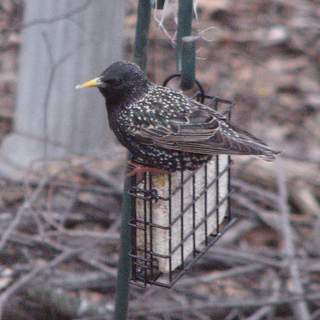 In my yard in 2014, the starlings didn't start eating suet until the beginning of February, which is when I started using the baited traps. Traps must be monitored constantly. Do not set any baited trap and leave it unmonitored. There is always the possibility of a native bird being captured. Birds left in a trap may die from shock. If a native bird is captured release it immediately. When starlings are caught, I suggest removing them immediately, no matter the type of trap. Leaving them in the trap doesn't attract more starlings in my experience, but teaches other starlings that they shouldn't enter the trap. Immediately remove starlings from traps so that the free starlings don't learn that it is a trap. Furthermore captured starlings sometimes find their way out of the funnel traps, so it's best to remove them immediately once they enter that style of trap. Starlings should not be released, but should be humanely killed. Euthanizing Sparrows & Starlings explains methods for humanely killing these invasive bird species. 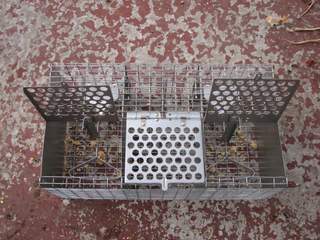 I've outlined three kinds of baited traps that I've used for catching starlings. I have found that the best bait for trapping starlings is homemade suet. It is much preferred to any of the prepackaged suet cakes by suet eating birds. The pre-packaged cakes use a lot of filler seed, like millet, that suet eating birds don't even eat. This Homemade Suet Recipe works great for attracting and catching starlings, and is relished by woodpeckers and other suet eating birds. The ingredients include animal fat, peanut butter, quick oats, corn meal, and flour. I think peanut butter is the key ingredient. I've hung store bought suet next to this homemade suet and the woodpeckers ignore the store bought suet. The only time they will eat the store bought is when the home made suet is gone. The starlings also prefer it to the store bought suet. In April 2018, I tried using bread as bait as I kept trapping yellow-rumped warblers, tree sparrows, juncos, and other birds as they LOVE homemade suet. The bread seemed to work quite well as I caught 13 starlings in one day and no native birds. 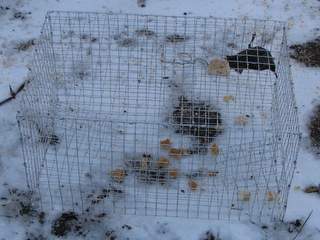 I hung a slice of bread above the trap in a suet cake basket/cage and sprinkled bread around on the ground. In March of 2014, I built a funnel trap that starlings can walk into but do not exit. It has one entrance funnel. I baited it with suet and bread in front of the funnel, inside the funnel, and inside the trap near the opening of the funnel. Within half an hour of setting it I'd caught two starlings. Within the day I caught two more. On average I've caught about five starlings a day in it. The beauty of the trap is the starlings don't shy away from it. They see the food, and walk right in. 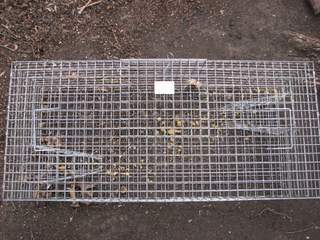 I made the trap with 1" square Galvanized Cage Wire that I purchased at Orscheln Farm & Home. The dimension of my trap is 24" long, 16" wide, and 12" tall. The funnel opening is 4" by 4" at the entrance and tapers to 4" wide and 2" tall at the exit. The length of the funnel is 8". The end of the funnel has tips of cage wire that can be bent to narrow the entrance. I cut an 5" by 5" door on the top for removal of live caught birds. After observing some of the starlings not wanting to enter my home-made trap, I determined that the funnel entrance was too short. I bent the funnel so that the opening to the trap is 3" and this seems to encourage more starlings to enter. To bait the trap I sprinkle crumbs of suet at the entrance, in the opening, and all over the floor of the trap. Locate it beneath your suet feeder where starlings are congregating. You Can Purchase the Tomahawk Double Door Rigid Live Starling Trap on Amazon below. I also purchased the Tomahawk Double Door Rigid Live Starling Trap to see how well it would work to catch starlings. It is a much larger trap than the one I built measuring 36" long, 16" wide, and 12" tall. It has a narrower but taller entrance with a longer funnel. I am amazed at the number of starlings it has caught. I have had a few starlings escape the trap though, but this could be remedied by bending the tines of the funnel to restrict the entrance/exit. The advantages of this trap over the trap I built is the starlings can walk in unobstructed by the height of the funnel. Because of its larger size it also holds more birds. Once a bird has been trapped in the funnel trap I block the funnel entrances so that the birds don't accidentally escape when they are fluttering around inside the trap. Because the Tomahawk trap has two entrances, I sometimes block one entrance to reduce the chance of escapes. Bait this trap the same as the Homemade trap. Sprinkle suet at the entrance of the funnel, in the funnel and all over the inside of the trap. Locate the trap below a suet feeder. In 2016 I found plans for a trap that is used in Australia to trap Australian invasive birds: Indian Myna & European Starling. The trap was similar to the funnel traps I had been using but differed in having a second compartment that the birds would enter after being trapped in the first compartment that contains the funnels. A piece of cloth is attached to the top of the holding compartment with a hole above the entrance. The hole guides the trapped starling through the hole into the holding compartment. The holding compartment also has a perch for the birds to rest on. I began using it in April 2016, which is near the end of the trapping season for starlings in Topeka. The trap seemed to work quite well. in 2017 I used it all season and did catch 40 starlings. This was fewer starlings that I caught in the other funnel traps but it may have been because of the location of the trap which was close to the house on my concrete patio. Bait this trap the same as the Homemade trap. Sprinkle suet at the entrance of the funnel, in the funnel and all over the inside of the trap. Locate the trap below a suet feeder. It's also a good idea to sprinkle food in the holding compartment to keep the birds content. Of all of the trapping methods I've used to catch starlings the funnel traps have worked the best by far. In March 2014 I trapped and eliminated 160 starlings using two homemade funnel traps and one Tomahawk trap. The trap appears to have two funnel openings but only one of them open to the trap. Learn how to set and bait a Tomahawk trap to catch starlings by watching this video. The elevator trap operates using a counterweight. When the starling steps on the elevator, he drops down and exits through a trapdoor to a holding chamber. In February of 2014 I implemented a repeating sparrow trap using suet as bait to trap starlings. I placed the repeating trap on the ground below a suet feeder hanging in a tree. This method works quite well with it catching 21 starlings in the last week of February, 2014. This is the Repeating Sparrow Trap that I'm using to catch starlings. I set the counter weight of the trap to its heaviest setting. This prevents smaller birds from getting caught. This setting of the counter weight doesn't scare the starlings as much when they step on the elevator part of the trap. If the trap is set for light weighted birds, the starlings are startled by the elevator mechanism. The trap must be monitored at all times while in use. When the trap cannot be monitored, the bait can be removed. Or the counter weight can be removed, making the trap inoperable. When I first began using the elevator trap, I thought it was the best trap available for catching starlings. But then I built a funnel trap and the number of birds I caught increased five fold. When using the elevator trap be sure the counterweight of the elevator is set for starlings, so they aren't startled when stepping on the elevator. If they are really hungry they seem to enter it without hesitation. Still I prefer the funnel trap over the elevator trap. 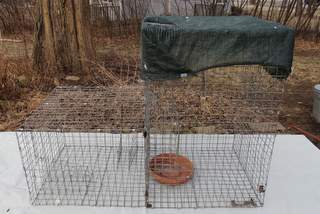 In March of 2014, I purchased a trap that catches one bird at a time using bait. The bird enters the trap, steps on the trigger, which closes the top of the trap. I bait this trap with suet as well. I found that placing the trap below suet feeders works well to entice the starlings to enter. The trap I'm using is the Nature House ST-1 Sparrow Trap. A very similar trap is the Songbird Essentials SEST1 Sparrow Trap. After three weeks of using this trap, I've only caught five starlings in it. When the trap goes off it scares away all birds that are in the vicinity. Plus starlings don't seem to see the food in the trap and so they rarely enter. Of all of the traps I've used to catch starlings I've been least impressed with the trapdoor. I think the birds are reluctant to enter or they learn quickly that it is a trap. It scares the birds away when the trapdoor closes and can only catch one bird at a time. This table reflects the number of starlings caught by month using various baited traps. I began using baited traps in 2014. In 2015, I used funnel traps as my baited method of choice for catching starlings. As you can see from the table, January through March are prime starling catching months for using baited traps. The number of starlings caught coincides with the lack of natural food found in late winter. Some years they may exhaust wild food sources sooner and hence can be caught earlier. Cold frigid weather also seems to improve your chances of catching more starlings. When it is cold they require more food and will often come to backyard feeding stations more readily. If you want to share your experiences with controlling starlings or learn more from others, consider joining the Starling Control Facebook Group.